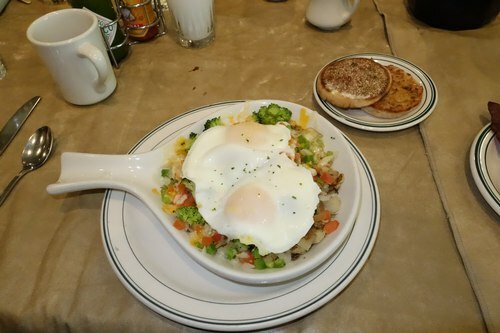 If you are into eating fresh, quality food, try the Farmer's Market Skillet at Benedict's Restaurant in Greenwood Village, Colorado. With a medley of vegetables (including tomato, broccoli, potato and onion), some cheese and two eggs, it is hearty without overstuffing. The flavor is subtle, yet distinctive, lingering on your tongue like a warm glow. 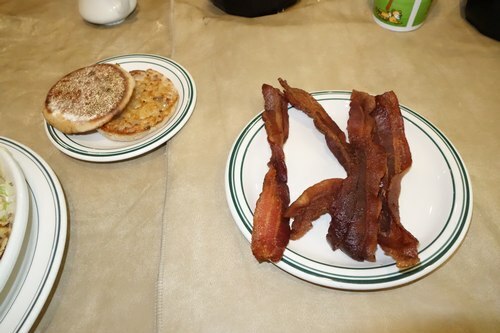 I balanced the vegetables with a side order of crisp lean bacon, which was also very flavorful. The skillet came with a choice of English muffin or toast. There were three choices for English muffin, which, considering I left The Mercury Café last night at 12:30 am, was a bit too much in a paradox of choice way, especially before coffee. I chose the honey wheat English muffin to try something new. It added a touch of sweetness to the morning. All in all, this was a meal worth writing about in a friendly space.